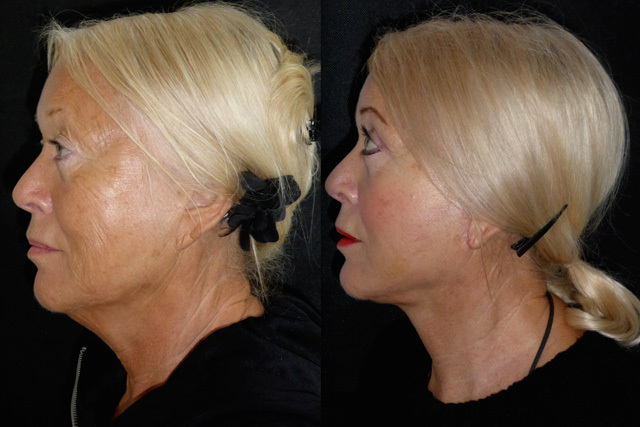 Heather had had several previous facial surgeries but sought my advice about her lower facial third and neck. 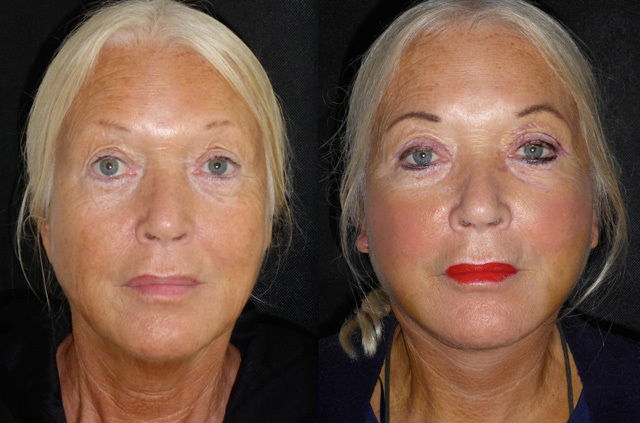 Her previous facelift had been lifted under too much tension leaving her with pixie ear deformities and the backwards vector of pull had reduced her mid facial volume. 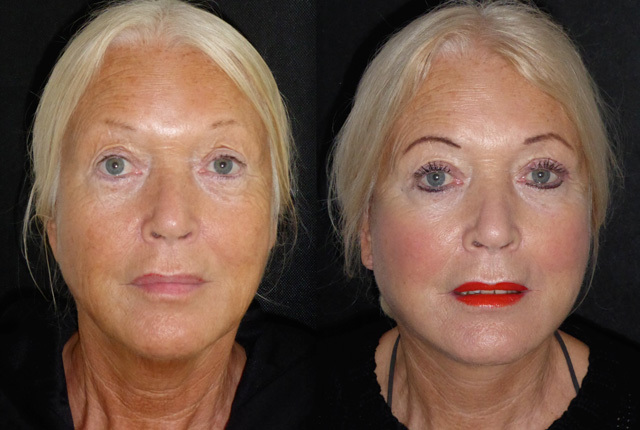 She underwent revision face and neck lift, platysmaplasty, sub mental liposuction and revision upper blepharoplasty under local anaesthetic and sedation. Here is her story. 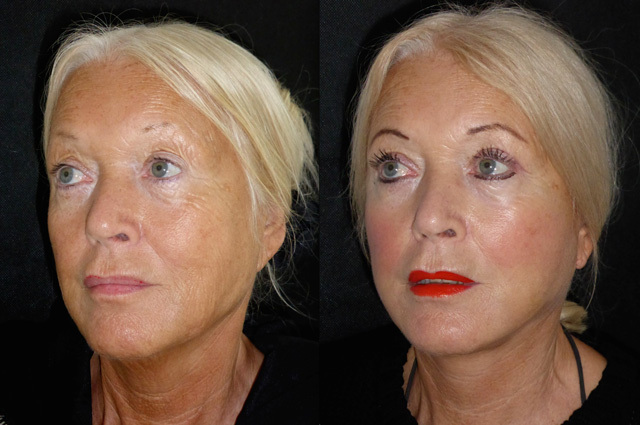 Morning after facelift and neck lift, platysmaplasty, sub mental liposuction and upper blepharoplasty. Heather’s surgery went really well. 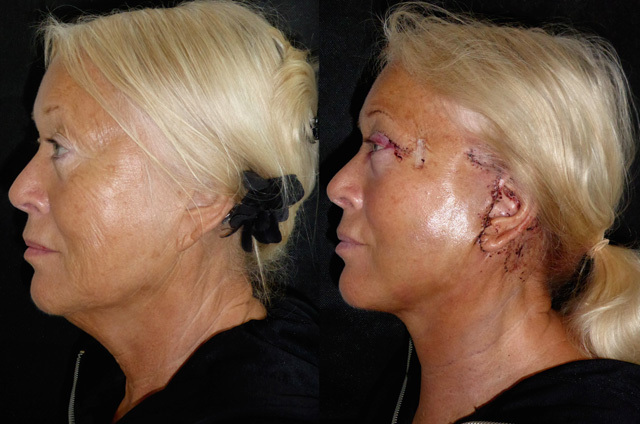 Interestingly from the underlying stitches, her previous facelift was a SMASectomy which removed some of her mid facial tissue. 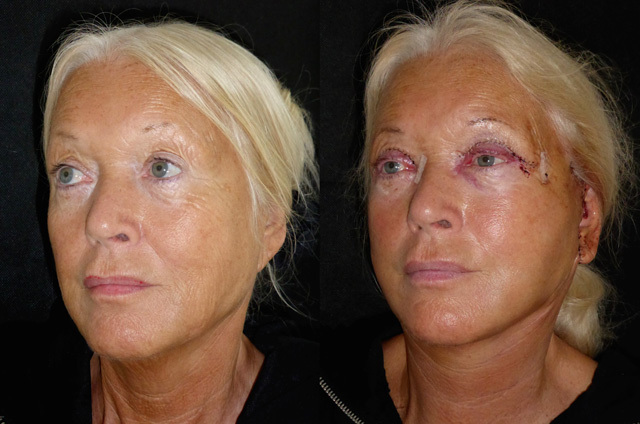 As too much skin had been previously removed, I removed really very little yesterday with the bulk of the work revectoring her underlying muscles and facial fat. I also repaired her pixie ears to give her earlobes back. 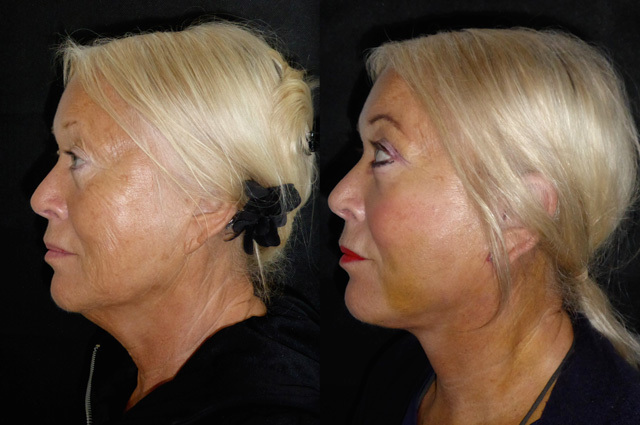 She is a little swollen, but these photos are taken only 12 hours after revision facelift surgery! 7 days later and Heather is back for removal of her stitches and looking lovely. Her face is less elongated and drawn and she has really nice mid facial fullness. Her neck line is beautifully defined and her bruising is fading. Make up is back on and another few days and she will be ready to wow her Tango class! 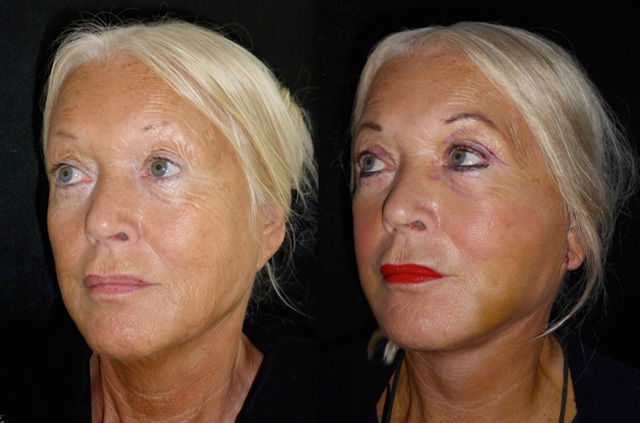 Heather has come back to see me just 4 weeks after her revision facelift surgery, and looks wonderful. Everything has healed beautifully, her face is fresh and voluminous and far less pulled than before. 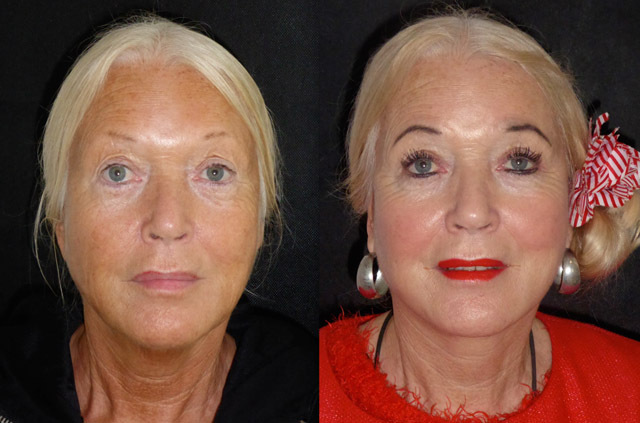 Her eyes are open and pretty following revision blepharoplasty and look at those lashes! The wonders of Lumigan! I will miss Heather until I see her again for her 3 month review. 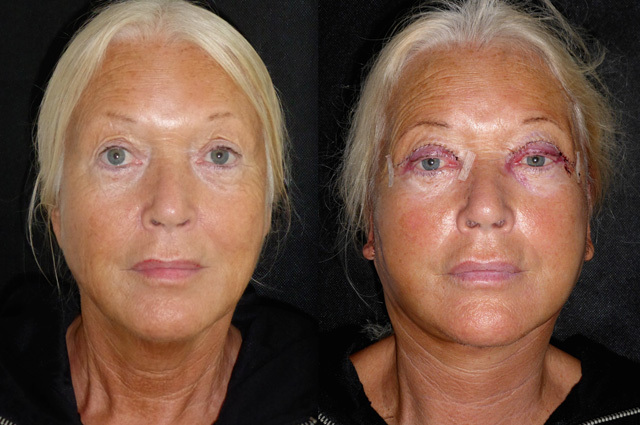 Heather is back up in Harley Street and WOW! She looks wonderful. Her face could pass for 20 years younger. 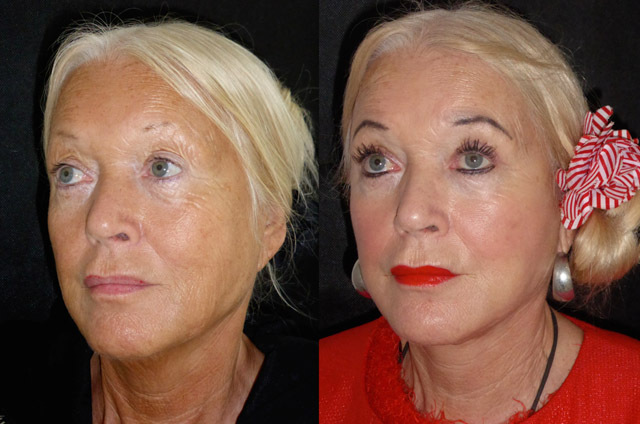 I know these photos are fully made up but there was no way I was going to ask her to remove her makeup for photos when she floated in to the clinic looking like a film star! 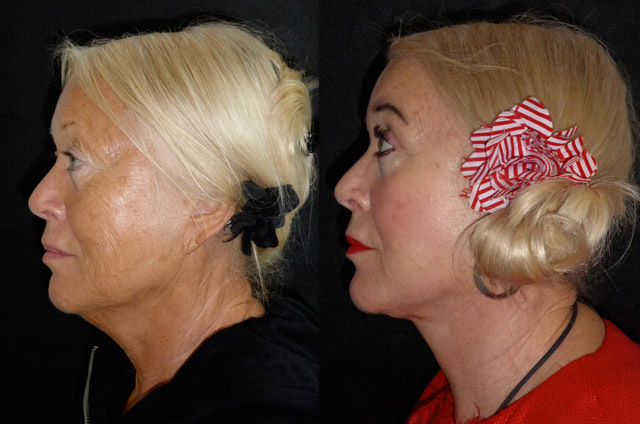 Her lift has held beautifully, her facial volumes are great, her pixie ears are repaired, and her skin is much tighter. May have to ease off on the lumigan though - she nearly knocked me over with her fantastic eyelashes!